Anywhere from 6 to 12 million children under 12 years old in the U.S. contract head lice each year, according to the American Academy of Dermatology. Head lice find homes in any type of hair, and head lice are not a reflection of the cleanliness of the host’s hair. Whether you have clean, greasy, straight or curly hair, lice can become a problem. Head lice are wingless, parasitic insects that can be found on a human’s head, eyebrows and eyelashes, according to the U.S. Centers for Disease Control and Prevention. They thrive on human blood, feeding throughout the day. However, they are not reported to spread disease like other blood-feeding insects such as mosquitos. Head lice can be found on any type of hair and are not an indication of poor personal hygiene. Head lice spread through direct contact because the insects cannot hop or fly. The CDC explained that head lice spread via clothing, personal items and head-to-head contact. Clothing that is particularly susceptible to spreading head lice includes coats, hats and scarves. Combs, brushes and towels are the personal items that are most likely to transfer lice from one host to another. Lice can survive on these articles for up to 55 hours, according to the Nationwide Children’s Hospital in Columbus, Ohio. What can be done to prevent head lice? A key to avoiding head lice is not sharing the personal items and clothing mentioned above. Nevertheless, it is still possible for people of all ages to get head lice, particularly children in day care, preschool and elementary school, where kids are in close contact with each other throughout the day. Getting head lice is not a reflection on one’s cleanliness or parenting. Often, head lice cause a tickling feeling on the scalp, as if something is moving, according to the CDC. Head lice also cause itching and sores on the head due to scratching. Difficulty sleeping is a symptom because lice become more active when it is dark. If you or a loved one experiences these symptoms, check the scalp for lice. They are typically the size and color of a sesame seed, and their eggs are yellow, brown or tan and the size of a pinhead, according to the AAD. If you are unsure or need confirmation that lice are causing the aforementioned symptoms, make an appointment or stop by a CareWell Urgent Care location for a visit with a health care professional. In the case that your child contracts head lice, do not worry. Getting rid of head lice is tedious but simple. 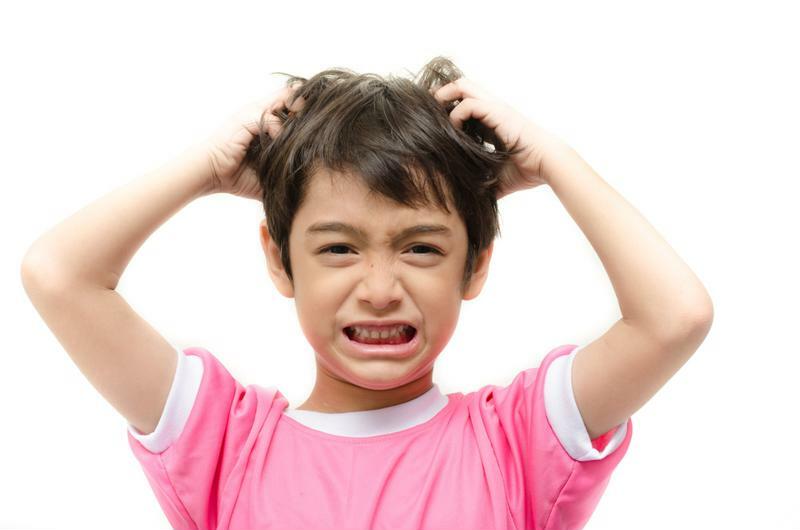 There are two main medications for killing head lice: over-the-counter and prescription. Either type works to remove the lice infestation. Simply follow the instructions on the lice medication, also known as pediculicide, to completely remove lice. Typically, this is a combination of washing, picking and combing. For children with extra-long hair, two boxes of medication may be needed. It is important to check everyone in a household for lice if one member of a family has lice. Because they spread so easily, especially in close quarters, it is best to get after and treat the faintest signs of head lice immediately. Beyond treating the hair and scalp, it is crucial to treat your home and wash and clean any areas that may have come in contact with the lice. These could act as temporary hosts until the lice can find a scalp. Typically, this includes washing sheets, pillowcases, blankets, towels, stuffed animals and clothes. For items that cannot be washed, such as brushes, the AAD recommended soaking the items in water that is at least 130 degrees Fahrenheit for a minimum of 10 minutes. Also, vacuum the carpet and any floor surface to remove all traces of hair that may have fallen out naturally. If your child still has head lice after two lice treatments, oozing sores on the scalp, a fever or swollen neck lymph nodes, Nationwide Children’s Hospital said to contact a health care professional immediately. You can reach CareWell Urgent Care online or via phone.